With "Vendor Onboarding" we introduce several features in ApiOmat version 2.1.0 that enable you to manage accounts that have direct access to ApiOmat. The SuperAdmin created accounts ("customers") that could create backends ("apps") and grant other customers read / write / etc. access. 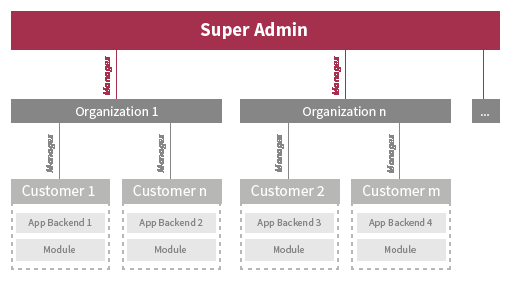 With Vendor Onboarding the SuperAdmin can still create customers directly, but he can also create organizations and assign customers to these organizations. The organization account can manage the organization, which means it can add and remove customers, grant read / write / etc. access to apps and modules, etc. Both the SuperAdmin and organizations can create contracts and assign them to all customers of an organization or specific customers. The customers then have to accept these contracts before they can access ApiOmat. Please read the sub pages to learn more about organizations and contracts.